A new study has found a close association between high-risk coronary artery plaque and non-alcoholic fatty liver disease (NAFLD), a common liver disease. 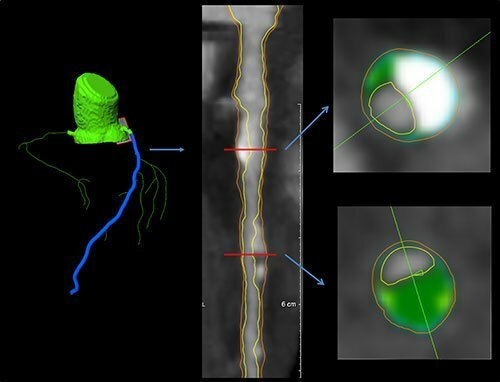 Both conditions were detected with a single CT examination, according to researchers who used coronary computed tomography angiography (CCTA) for the study. Previous research has shown that CCTA can detect high-risk coronary artery plaque, or plaque prone to life-threatening ruptures. “As it is known that atherosclerosis is linked to inflammation, our next step was to look for an association of high-risk plaques with other systemic inflammatory conditions such as NAFLD,” said lead author Stefan B. Puchner, MD, of Massachusetts General Hospital and Harvard Medical School in Boston (MA, USA) and the Medical University of Vienna, Austria. For the new study, Dr. Puchner and colleagues looked at associations between high-risk plaque and NAFLD, a condition characterised by abnormal liver function that is not associated with excessive alcohol consumption. NAFLD is the most common liver disease, with an estimated prevalence of 20 percent to 30 percent in the general population. “Interestingly, both pathologies can be detected in a single CT examination,” Dr. Puchner pointed out. Results of the study have been published online in Radiology. Patients who took part in the study came from a large trial focusing on the use of CCTA in people who had come to the emergency department with acute chest pain. They underwent both non-enhanced CT to assess coronary calcium, a marker of atherosclerosis, and contrast-enhanced CCTA. Readers assessed the CCTA images for signs of high-risk plaque. Of the 445 patients in the study, 182 (40.9 percent) had CT evidence of NAFLD. High-risk plaque was seen in 59.3 percent of patients with NAFLD, compared to only 19 percent of those without NAFLD. The association between NAFLD and high-risk plaque persisted after adjusting for the extent and severity of coronary atherosclerosis and traditional risk factors. The results suggest that high-risk plaque and NAFLD are both part of the same systemic disease process, metabolic syndrome, according to the researchers. Dr. Puchner's team plans to extend the study outside of the emergency department setting to determine if the results apply to other categories of the general population. Also, the team is keen to learn more about why NAFLD is so common amongst people with advanced high-risk coronary atherosclerosis. Experts say that both conditions are a consequence of systemic inflammation, an inflammatory state that affects multiple organs and can lead to life-threatening conditions. "(Our) aim will be to further investigate and understand, with the help of CCTA, the interplay between advanced atherosclerosis and NAFLD as part of a complex systemic inflammatory condition,” Dr. Puchner added. Axial nonenhanced CT image in a 62-year-old man demonstrates attenuation measurements of the liver and spleen. Image shows a diffuse fat accumulation in the liver, with a mean liver attenuation of 32.5 HU and a mean spleen attenuation of 46.2 HU. Figure 1. Flowchart demonstrates study population enrollment, both exclusion and inclusion. CCTA = coronary CT angiography. Figure 2. Coronary CT angiography images demonstrate examples of high-risk plaque features. A, Image was obtained in a 63-year-old man with partially calcified plaque, positive remodeling (vertical arrow), and spotty calcium (horizontal arrow). B, A cross-sectional view of a noncalcified plaque in a 65-year-old man demonstrates a napkin-ring sign with a central low-attenuation area, surrounded by a peripheral rim of higher attenuation (arrow) next to the lumen (∗). C, Image in a 60-year-old woman with partially calcified plaque demonstrates a low CT number in the midportion (arrow).